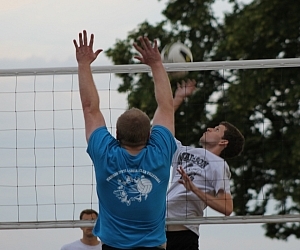 We run outdoor sand leagues in the Spring and Summer and indoor leagues in the Fall and Winter. Spring season usually starts mid-May and runs through mid-July, and Summer starts in mid-July. Fall Indoor leagues typically start at the end of October, with the first session finishing up in mid-January and the second beginning in January and ending in Mid-March. Depending on facility scheduling, there may be another session from mid-March to mid-May. We are offering five leagues starting in January and February 2019. All leagues are held in large gyms with wood or composite floors. The league fees vary depending on the facility, the number of courts, and the number of weeks available. Teams select their skill level during registration and we will segment into separate skill divisions whenever possible. All leagues have a capacity and many sell out. Capacity for our outdoor sand leagues tends to be higher than our indoor leagues, but both usually have nights that sell out. Do not wait to sign up if you want to play. Overall, our leagues tend to be at a lower level of competition than others out there. Please sign up for a higher division whenever possible, as teams who actually belong in Lower do not enjoy getting destroyed by teams who are much better than them. MSSC reserves the right to move teams if we know how good they are and believe they are in the wrong division. Individual registration details: Individuals may sign up and we will place you if we can. No payment is required at sign up; we will contact you if we have a spot for you and place you when payment is received. With six leagues available for Winter 2019, there is a good chance we will be able to place a lot of free agents for the season.